The Saskatchewan Canola Development Commission (SaskCanola) is now accepting nominations to fill four positions on the Board of Directors starting in January 2019. 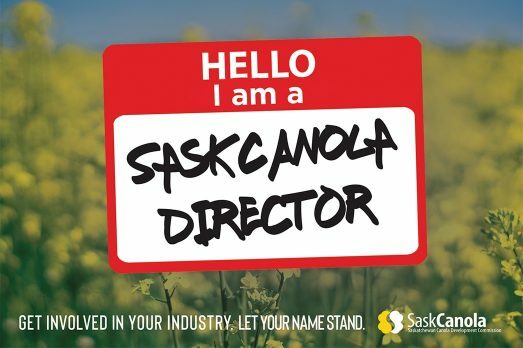 SaskCanola is looking for board members who have a desire to strengthen and grow the canola industry. The call for nominations opened Aug 1 and closes Friday, Sept 28 at 12:00 PM CST. The SaskCanola Board is comprised of a total of eight directors. Board members are elected for a four-year term and are eligible to be re-elected for a second four-year term. Nominees for the board must be registered canola producers; a registered producer is any producer who has sold canola and paid levy in either of the previous two crop years. call 306-975-0262 for a nomination package. All applications must be received no later than 12:00 PM CST on Sept 28, 2018. For further details regarding SaskCanola’s election, visit saskcanola.com/election. 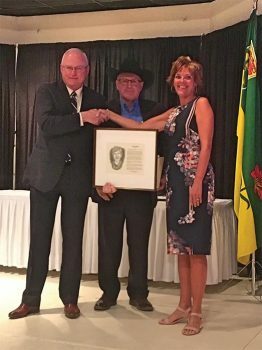 Joan Heath shakes hands with the Honourable Lyle Stewart as she is inducted into the Saskatchewan Agriculture Hall of Fame. It is SaskCanola’s distinct honour to congratulate Joan Heath on her induction in the Saskatchewan Agriculture Hall of Fame. Joan, her husband Corey Loessin, and their two children, Audra and Aidan, farm near Radisson with a focus on grains, pulses and oilseeds. Joan is the former Executive Director of the Saskatchewan Canola Growers Association, former SaskCanola Market Development & Communications Manager, and former SaskCanola Boardmember, Vice-Chair, and Chair. Joan’s been a strong advocate for the agricultural community and the canola industry for nearly 30 years. Thank you for your leadership and advocacy Joan. Your canola family is so grateful for and proud of you! 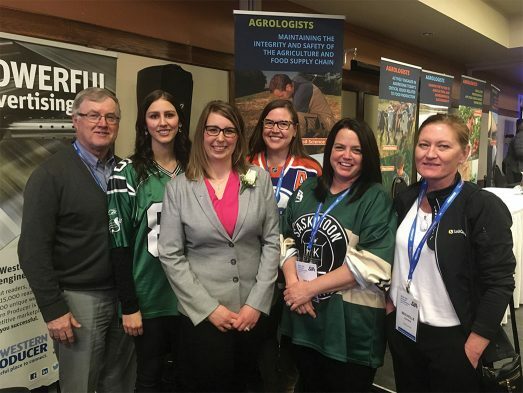 The SaskCanola team is extremely proud of and would like to congratulate Errin Willenborg, our Research Manager, on being the deserving recipient of the 2018 Outstanding Agrologist of the Year as awarded by the Saskatchewan Institute of Agrologists. In a grower communications survey we conducted this past winter, 93 per cent of growers reported being relatively satisfied with the information and communication they receive from SaskCanola. One gap in communications that was identified by growers was Facebook, so we have addressed it by adding this social media platform to our repertoire. 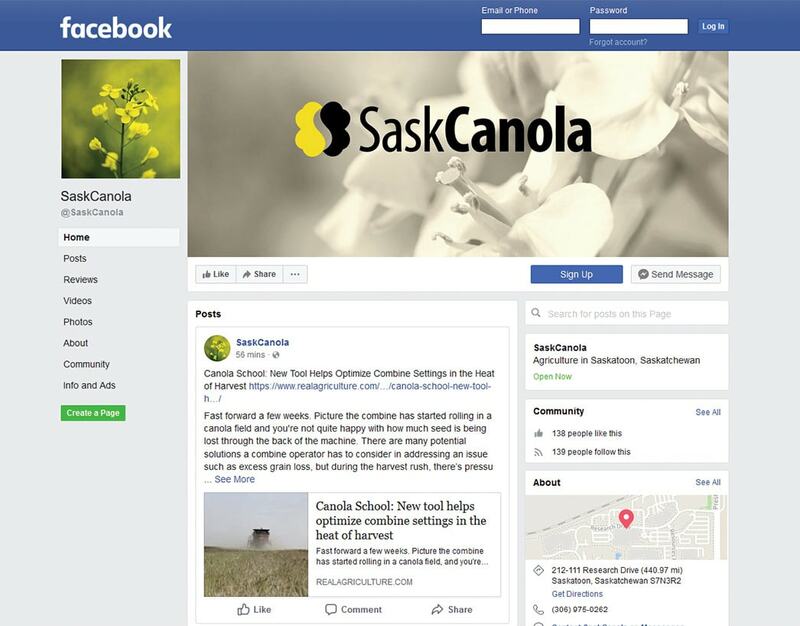 Follow us and like our page on Facebook @SaskCanola. 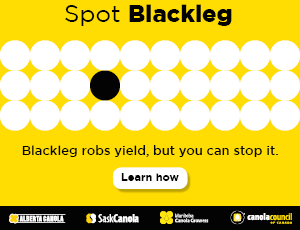 Other popular ways to stay connected with SaskCanola, as reported by growers, include our monthly e-newsletter (sign up at saskcanola.com/news/subscribe.php) and Twitter. Follow us on Twitter @SaskCanola. SaskCanola is pleased to announce that we have awarded the prestigious Dr. Roger Rimmer Award for Excellence in Graduate Research to five graduate student researchers for the 2017-18 year. The scholarship program offers $18,000 per year for a maximum of two years to students entering or continuing studies in a M.Sc. or Ph.D. program at the University of Saskatchewan whose thesis projects deal with an important aspect of either the development or utilization of canola as determined by the SaskCanola Board of Directors. Jennifer Bell studying the effect of feeding yeast-fermented canola meal on the nutrient digestibility and growth performance of rainbow trout and Nile tilapia. Shanay Williams-Johnson studying the transcriptome analysis to identify genes for tolerance of abiotic stress in B. napus. Musharaf Hossain studying the identification and functional characterization of putative effectors of Plasmodiophora brassicae and their role in regulating cell death during infection. Zayda Morales studying the canola seed microbiome: a new approach towards improving crop productivity in a sustainable way. Yan Ran Tang studying the development of a canola-based oleogel. BE IN THE KNOW! For the latest canola news and information, subscribe to SaskCanola producer updates at saskcanola.com.